I am exceedingly familiar with many archaeological monuments in Greece. When I studied abroad in Athens, I ventured up to the Acropolis on the regular. While working at Nemea and Mycenae, I got to know those ancient stones and columns all too well. I’ve gazed up at the Venetian fortress in Nafplio many, many times. But visiting these venerable places with my husband and parents added an extra special layer to the memories I’ve created. 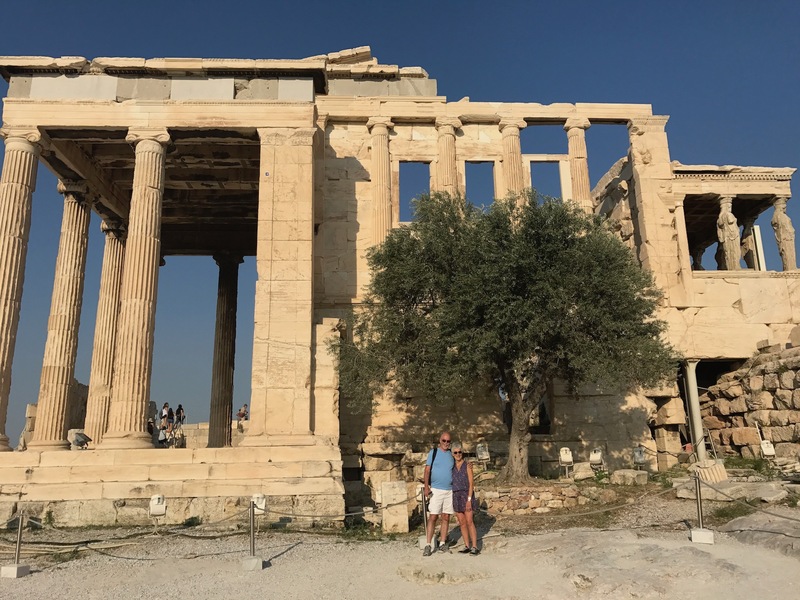 When we decided to stay in Athens as part of our year in Europe, a large part of my excitement revolved around visiting the sites with my family. I couldn’t wait to see their faces light up as they gazed at 2,500 year old structures. Joe and I explored a few sites and museums before my parents arrived, and I was surprised by how much I did – and did not – remember. But as the increasingly hot summer days rolled on, my Greek became smoother and my brain sharper. 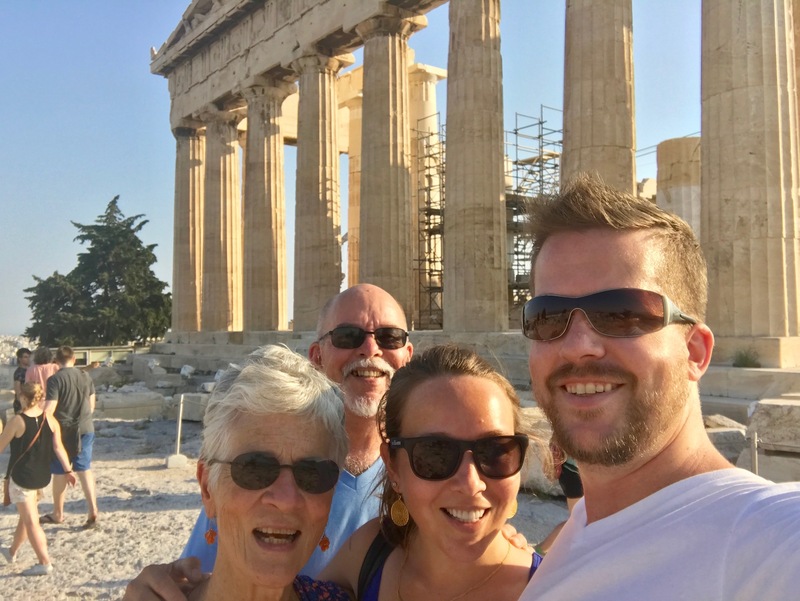 The family and the Parthenon! 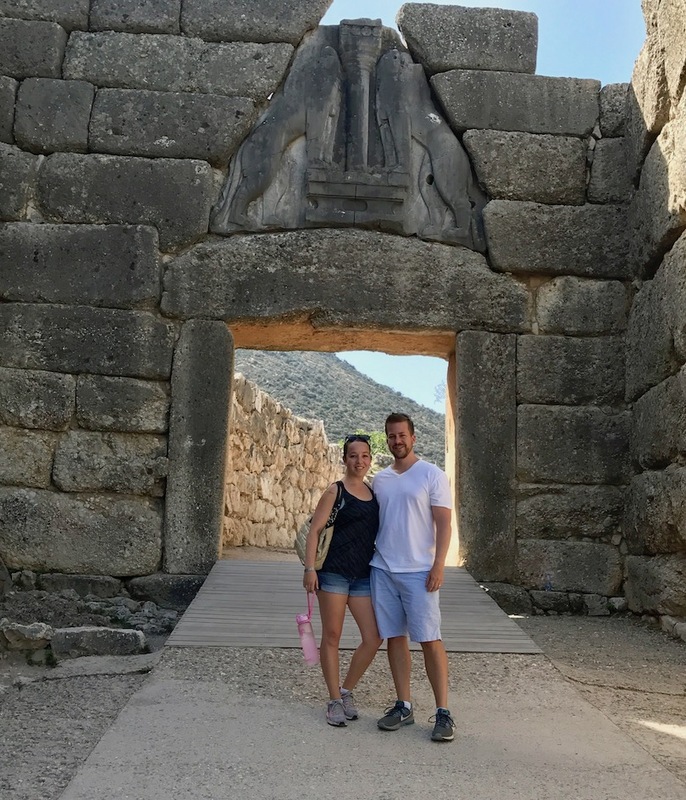 We waited to visit the Acropolis until after my parents arrived. Of course, this meant hiking up a very steep path in 98 degree heat. Unfortunately, we could not predict the heat wave that would hit Greece a few days before mom and dad landed. Welcome to Athens! Here, we roast the tourists for dinner! Because of the furnace-like conditions, and after the recommendation of a family friend, we planned our trip for the evening hours. What a fortuitous decision! A gentle breeze kept us from melting completely as the sun’s rays gradually softened, and the crowds up top were lighter than usual. It was a joy to casually wander around the Erectheon and up to the Parthenon once again. But we couldn’t leave the Acropolis without a story: A terribly grumpy guard became offended by our traveling gnome figurine, and refused to allow Joe to photograph the little guy. “Why you come all the way to Parthenona to look at this silly toy?” she wondered. After attempting to explain the Gnomad’s travels and meeting with more rude comments, we simply relocated to the other side of the temple. And furtively snapped photos. Sigh. During our weekend in Nafplio and the Peloponnese, I insisted that we visit the sites where I had worked. The aforementioned heat wave was in even fuller effect, but we planned to go early and drink copious amounts of water. I almost forgot what it’s like hiking around the citadel of Mycenae with the sun pounding down mercilessly. Good thing I got a refresher! My parents were enamored of every wall, massive stone and secret underground cistern. Their delight fed my soul. Perhaps my favorite moments, however, occurred at the Temple of Zeus in Nemea. 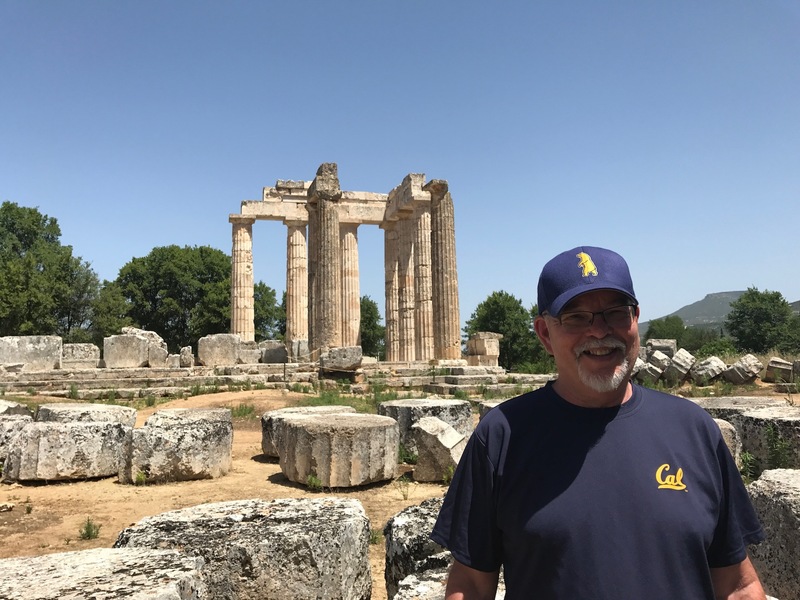 The University of California (my alma mater) has taken on the massive project of restoring the temple, and my parents couldn’t have been more excited. After all, my father is also a Bear, and my mother has adopted the Cal family wholeheartedly. As we wandered beneath the tall columns, my mother gently wrapped her arms around one in a big bear hug (pun intended). 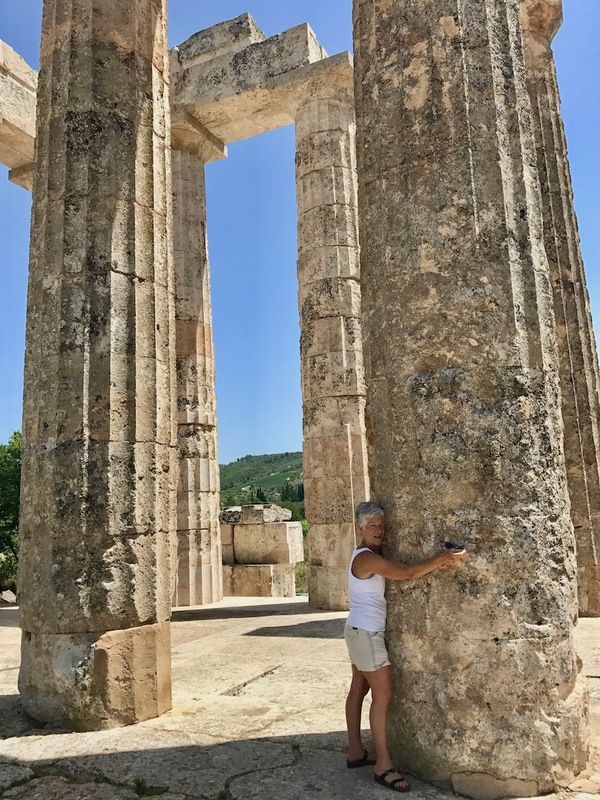 She loves the Temple of Zeus! 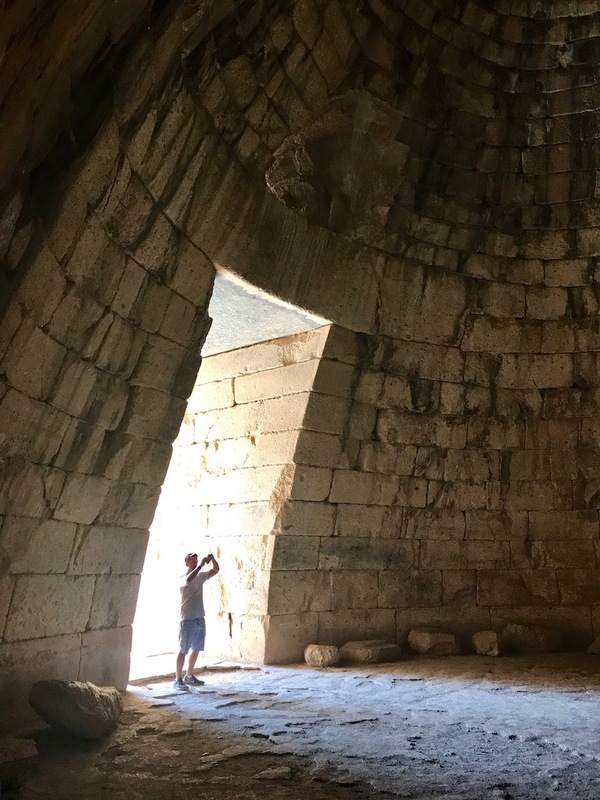 Despite the heat, Joe and my parents embraced the opportunity to soak in some archaeology and reconnect with my past. My mom asked me what it was like to return to these places. At first, I thought it was just another day on site. I’ve spent so much time with these ancient things that I sometimes forget how awe-inspiring they can be. Appreciating monuments like the Parthenon, an ancient stadium and a huge, domed tomb should boggle the mind a bit. They have managed to survive, in some form, for millennia. The Greeks managed to erect a near perfect structure without the aid of computers. What have we built that will remain so influential and so iconic in the year 4,500? I hope I never forget the way the sunlight filters through all 17 columns of the Parthenon’s long sides. I hope the sheer size of the stones moved at Mycenae never ceases to amaze me. And I hope I’ll always return to Greece to keep those feelings fresh within me.